There are two main White’s GM series metal detectors. 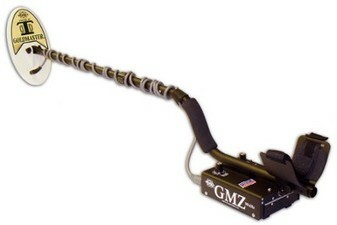 The White’s GMT and the GMZ metal detector models. Whites electronics developed an electrical partnership that has never been improved upon and it continues today with the GMT: Fast Auto-Trac and rotary controlled Self Adjusting Threshold (SAT). Extreme sensitivity for the tiniest pieces of gold in most ground conditions. A twin method iron ID system reduces any chances of having to dig useless iron or steel targets. A powerful elliptical DD coil design manages ground mineral feedback whilst maintaining amazing sensitivity to the tiniest pieces of gold…..find the gold that other detectors miss! The GMT is White’s “Goldmaster” — used in goldfields around the world! This detector ignores the harsh ground found in gold-bearing areas to simplify prospecting and find nuggets large and small, and coins, too.The GMT is made for gold country, with 48 KHz operating frequency — the best for gold — and a waterproof search coil that’s ready for streams and rivers. Operating Frequency: 50 kHz: Operating at the optimum frequency to detect small, medium, and large gold. All-Metal Operation: Hear all metal targets. Especially good for prospecting, the GMZ has no iron or trash metal rejection. Accessory Coils: Can be used with any White’s Goldmaster Series (48 kHz – 50 kHz) accessory search coils. Can also be used for prospecting as well as industrial “All Metal” applications where small targets and high sensitivity to all metal types are desired. The GMZ simplifies gold prospecting. The easy-to-use manual ground rejection system ignores the harsh ground typically encountered in gold-bearing areas. There are just two other controls, for sensitivity and ground toggle. The high-frequency 50 kHz coil is optimum for discovering gold, and the all-metal operation won’t disregard any signals — which you’ll hear clearly because of Silent Search, which eliminates the threshold sound normally heard at all times. At only 3.4 pounds with batteries, the GMZ is comfortable and well-balanced for all-day use in the field. The place I chose for the field test was a typical desert creek bed I had come across by chance about two years prior. I remember it was summertime and I had been out detecting most all afternoon and digging nothing but bullets. I was starting to feel a bit overheated plus my canteen was running low, so I decided to turn up the creek hoping it would be a short cut back to my truck, where I knew a jug of ice cold water was waiting. As I hiked along I began seeing a few stretches of exposed bedrock. I left the detector on and quickly scanned the bedrock as I went. When I hit the first nugget about a quarter of the way up I quickly forgot about my thirst. Most of the country rock was covered in overburden, however everywhere it popped up through the gravel I was able to pull gold. The little creek never yielded anything large, but my lucky shortcut netted me nearly a half-ounce worth of small nuggets. I had always wanted to revisit the site and see if I had left anything behind. Now that I had the GMZ to test, it offered the perfect excuse for another road trip. Upon arriving, I was overjoyed to see that two years worth of monsoon rains had done wonders on the creek. The rushing water had shifted the gravels considerably and exposed entirely new stretches of bedrock. I was also glad to see that there weren’t any fresh detector dig holes. It appeared that so far this spot had remained a secret. My first signal came quickly enough. The baseball-sized rock was actually lying on the surface and at first glance I thought I had found a gold-bearing specimen. Unfortunately when I cracked it in two I spotted the distinctive reddish color of hematite. No gold, just your average run-of-the-mill hot rock. I spent most of my time on the bedrock, paying special attention to those stretches which looked as if they had just recently been uncovered. The creek had not been trashy to begin with, so I wasn’t surprised by the lack of targets. After an entire day of detecting I only dug up twelve true metal targets and three more hot rocks. Fortunately out of the twelve, two ended up being gold. The first sounded exactly like a slug of lead, but when it didn’t move after kicking away the surface material, I knew it had a chance. Some three inches later I hit the decomposed bedrock and went down on my hands and knees for a closer look. Using the nose of the coil I was able to quickly pinpoint the object’s location in one of the cracks. I couldn’t help but smile when I swept aside the loose sand and revealed a lovely, butter yellow color. I had found my first nugget with the GMZ! Later that evening I tossed it on my digital scale; the piece weighed out at 1.3-grams. The second find for the day came about an hour later from a similar stretch of bedrock. This one was sitting on top and didn’t require any real digging other than a sturdy twig to pry it from its hiding place. Although smaller than the first, it was still a keeper. My total take for the day was 1.7-grams. Not one of my best hunts, but certainly not one of the worst. Going home with a big, chunky nugget in my pocket would have been nice, but ultimately I accomplished what I had set out to do; prove that the GMZ can indeed find gold. If the engineers at White’s set out to create one of the industry’s easiest turn-on-and-go gold detectors, then they definitely succeeded. In less than a minute I had the GMZ tuned and was out swinging. Setting up the unit is truly a breeze. I simply placed the Ground toggle switch into the Normal position, turned the Ground Reject knob fully counter clockwise, and finally turned the Sensitivity knob clockwise to the factory suggested preset mark. The soil at the test site was moderately mineralized, and initially I did experience some feedback as I pumped the coil back and forth towards the ground. This was easily fixed by increasing the Ground Reject setting. When the sound disappeared I knew the machine was ready to go. It should be noted that continuous noises are an indication that the detector is not properly ground balanced, and that the Ground Reject knob should be turned further clockwise. It is important to keep the machine running smoothly, but never increase the Ground Reject setting more than necessary, as this will most likely reduce sensitivity and depth penetration. I would suggest that a person try to always run the Sensitivity as high as possible. This will make target signals sound crisper and more distinct, while also increasing overall depth. The downside with a high Sensitivity setting is that it may also amplify ground noise, which can actually mask good targets. In this case, it may actually be beneficial to reduce Sensitivity slightly rather than upping the Ground Reject. If you find yourself struggling to keep the machine running smoothly, you may want to experiment with the Salt position. This setting provides better stability when working in regions with heavy concentrations of conductive salt or alkali, or if the ground is wet. Although my field test site did not require its use, it was nice to know it was there if needed. I know there are some folks out there that like silent operation detectors, but to be completely honest, I am not one of them. Sure, the constant buzzing of a threshold can be annoying, but that buzz is packed with a lot of valuable information. Often times a small, or a very deep gold nugget, will not always produce a clear, distinct signal. Many of these subtle targets, which often turn out to be gold, will only trigger a slight waver in the threshold. A silent search detector will likely miss some of these ‘iffy’ targets; however they are a lot less fatiguing on the ears. For myself, I don’t mind the extra noise, so if I could have added anything to my wish list for the GMZ, it would have been the addition of an adjustable threshold. My overall impression of the GMZ was positive. As I mentioned before, what impressed me most was its incredibly easy operation. The controls on the GMZ represent simplicity at its finest! There is essentially no learning curve, and I feel that even the most inexperienced hunter should be able to master it within an hour. At only 3.3 pounds (including batteries) the detector can be swung for hours with little fatigue, plus it is compatible with any White’s Goldmaster Series (48-50 kHz) coils. True, I would have liked to have seen an adjustable threshold and a free skid plate would have been nice, but with a retail price of only $499.95, this detector offers good performance at a very reasonable price. If you are searching for a good quality entry level gold machine that won’t break the bank; then the White’s GMZ is certainly worth consideration.